As John Roemer says in his introduction to this volume, 'During the past decade, what now appears as a new species in social theory has been forming: analytically sophisticated Marxism. Its practitioners are largely inspired by Marxian questions which they pursue with contemporary tools of logic, mathematics, and model building ... These writers are, self-consciously, products of both the Marxian and non-Marxian traditions.' 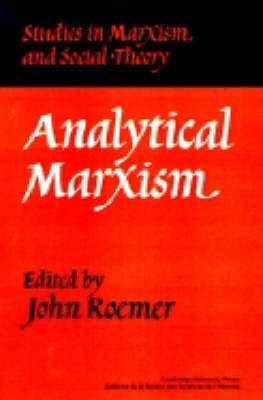 This volume assembles substantial and original essays, both published and unpublished, by some of the leading practitioners of 'analytical Marxism'. The essays discuss a number of the fundamental issues of Marxian thought as well as questions that conventional Marxists see no need to raise. They exemplify the ways in which analytical Marxists are beginning to reinvigorate the Marxian tradition and, in doing so, to break down the barriers that have divided it from other forms of social theory. The volume will make an excellent textbook and an ideal introduction to this new approach.